The New GMoneyPro Is Here And Is Better Than Ever! Whether you've just now decided to give internet marketing a try and have no past experience or if you're a savvy internet marketer looking for the next best way to boost your Google success, GMoneyPro is exactly what you've been looking for. 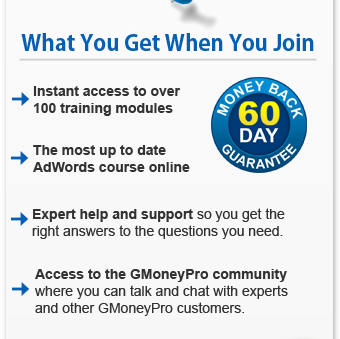 GMoneyPro is the internet marketing mecca for Google success. With over 100+ training modules, an active community, and dedicated expert help, you will receive everything you need to know to achieve success with Google. So it doesn't matter if you don't have a website and have never don anything online in the past or if you manage an advertising firm, GMoneyPro will show you how to start making money, increase your profits, and rank higher on Google than you ever thought possible. GMoneyPro will not just show you what you need to know and expect you to figure the rest out. Instead you will learn exactly what to do every step of the way until you advertising efforts allow you to surpass 90% of other AdWords advertisers. Then you will be shown highly advanced advertising techniques and strategies used by advertising experts to allow you to take your account to the next level giving you more traffic, more sales, and better performance at a lower cost. As a beginner you will learn the basics of Google advertising and will be shown exactly everything you need to do to get your advertising account up and running without making mistakes, spending too much money, or feeling overwhelmed. You do not need a website or a product of your own to start doing this. GMoneyPro will show you how to simply promote other people's websites for them as an affiliate and get paid commissions on the sales you generate. GMoneyPro will show you what to do every step of the way until you reach the intermediate level, so you will never become lost or confused. Plus, if you do need help expert guidance is easily available to give you the answers you need. If you're an intermediate, you should already have an idea of how to advertise on Google, but you may not be getting the results you were expecting. It can be tricky to advertise on Google, so as an intermediate you will start learning important strategies on how to improve account performance, increase click through rates, boost your quality scores, and expand your campaign. GMoneyPro will show you what needs to be done so you can not only start seeing the results you were expecting, but so you can begin to exceed what you expected. It's recommended you look at the "What You Will Learn" page so you will see everything you will learn with GMoneyPro. As an experienced advertiser you should already know how to turn most AdWords accounts into successful accounts. But there are still those moments where you ask yourself "What else can I do to get this account performing even better?". GMoneyPro will give you the advanced marketing strategies so you can exceed your advertising goals and get in the top ranking positions for your keywords without having to pay an arm and a leg to get there. As an experienced advertiser you are most likely looking for specific details on what GMoneyPro can offer. This is why it's recommended you look at the "Experts" section of the "What you will learn" page so you can see if GMoneyPro can give you what you need. What Makes GMoneyPro So Effective? With nearly a decade of advertising experience with Google AdWords, I can confidently say that I know exactly what it takes to turn any website or product into a success on Google. With my experience I can easily show you shortcuts, tricks, tips, and strategies you need to start seeing results. Google frequently updates certain rules, policies, and tools and it's important that you know of these changes so you don't accidentally hurt your results. Luckily, unlike other guides or books, GMoneyPro is updates on a nearly weekly basis. On the left side of the page within GMoneyPro you will see what sections were last updated so you can quickly review the updated material. Plus, since GMoneyPro is accessed online, you will immediately be given the update information. There will be no need for you to manually download the updated changes. Understanding what you are doing is vital to online success, and this is where GMoneyPro really out performs the competition. Unlike other products that just give you all the data at once and tell you to email them if you have any questions, GMoneyPro allows you to post questions at the end of each section and training module. This way you can ask your question without having to leave the information. As long as you have an internet connection, you can access GMoneyPro from any device anywhere. Besides laptops and computers, GMoneyPro can be accessed from smart phones, iPods, iPads, tablet devices, and any other device that allows you to browse the internet. With GMoneyPro you will have access to learn everything about online success. I will not keep any secrets and will not hold anything back from telling you the absolute truth about your efforts. If you just spent several hours working on something and I feel it will not perform well, I will tell you. I would much rather hurt someone's feelings and see them succeed. If you are unhappy with this course in any way, please let us know and we will issue you a full refund. If you implement the strategies within GMoneyPro and you don't decrease your advertising costs, don't see an increase in click through rate, or don't see any noticeable increase in performance within 60 days, then let me know and I will issue you a full refund. If you already know everything within GMoneyPro or if you can find all of the information within GMoneyPro on other sites, forums, or books, then let me know and I will issue you a refund. If you're ready to learn everything there is about success with advertising on Google, and if you're ready to start making money online (even if you don't have or don't want a website of your own), then join GMoneyPro today and try ti risk free for 60 days. Take full advantage of GMoneyPro Beta by taking advantage of our reduced membership package of only $29.98 per month! By joining today you will only pay $29.98 per month even when GMoneyPro goes to it's final price of $97 per month once the Beta is completed. What is GMoneyPro Beta? GMoneyPro Beta is the near complete stage of the final GMoneyPro. In Beta we will be adding new material, training modules, and interactive features. When we have finished adding all these features GMoneyPro Beta will become GMoneyPro and the membership fees will increase for new members. There's no contract, minimum terms, or requirements for you to cancel your membership. Internet marketing isn't for everyone, and if you find you don't like it you can cancel with zero pressure from us. GMoneyPro is not associated, endorsed, or affiliated with the Google corporation. ClickBank is a registered trademark of Keynetics Inc. a Deleware corporation. GMoneyPro.com is not affiliated with Keynetics Inc. in any way, nor does Keynetics Inc. sponsor or approve any GMoneyPro.com product. Keynetics Inc. expresses no opinion as to the correctness of any of the statements made by GMoneyPro.com in the materials on this web page. This site and the products and services offered on this site are not associated, affiliated, endorsed, or sponsored by Google, nor have they been reviewed, tested, or certified by Google.